We’ve updated our system today with new features that make Kitely easier to use. First, we’ve made it easier to work on worlds outside of Kitely by introducing an intelligent way to replace existing worlds with new OAR files. Second, you can now automatically disconnect yourself if you are inactive for a long time. Similarly, you can disconnect visitors to your worlds if they are inactive for a long time. Finally, we added a progress bar during OAR file uploads. All of the settings in the Manage World dialog, e.g. the world’s description and its access controls. The world’s URL remains the same. The world keeps all of its Likes and Tweets. If possible, we keep the existing parcel settings. Here’s how this works: normally, an OAR file contains a list of parcels and their settings, so when you load a new OAR file the parcels in that OAR file wipe out the previous parcels. However, often the new OAR file isn’t really a completely different world, but just a newer version of the existing world. In that case the parcels are probably the same, and it would be convenient to keep the parcel settings already in Kitely instead of wiping them out. We recognize this case by comparing the parcel names in the existing world and the new OAR file, and where parcels have the same name we keep their existing settings instead of taking them from the OAR file. This affects the parcel’s flags (e.g., “No Build”), and the parcel’s permissions: which group it belongs to; which users can enter it; etc. The Replace World feature can be found in the Files tab of the Manage World dialog. (This dialog was previously called Edit World; we renamed it.). We’ve also moved the Export World feature to this tab. Replacing a world costs 10 KC. Some people felt anxious about accidentally forgetting to disconnect when they left their computer and losing Minutes because of it. Other people asked for a way to automatically remove people who were “parking” their avatars in their worlds (i.e., remained logged in even when they were inactive for extended periods of time). We’ve listened to your concerns and have added a couple of features that enable you to automatically disconnect yourself, and/or people who visit your worlds, when your avatars haven’t moved or chatted for more than 30 minutes. Your Kitely account Settings page now includes a setting called “Disconnect from worlds when idle”. When that setting is enabled (which is the default), you will be automatically disconnected from the world you are in if your avatar remains inactive for 30 minutes. 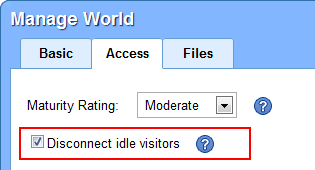 Each world has a similar setting in its Access tab, called “Disconnect idle visitors”. When enabled (which is the default), visitors to the world that are inactive for 30 minutes will be automatically disconnected. This is especially useful when you set the world to allow free access to your friends, because it prevents them from accidentally using up too many of your Kitely Credits. When a user has been idle for 3o minutes we don’t disconnect them immediately: we show a warning message first. The user then has 1 minute to click on a button labeled “I’m Here” to prove that his or her avatar is still active. If they do so then they can continue being idle for another 30 minutes before the warning message appears again. If they don’t click the button within 1 minute then they’re automatically disconnected from the world. We’ve updated the Mac version of Kitely Plugin to version 2.0.1. The only difference from version 2.0.0 is that we use a digital certificate to sign the plugin (for the first time on the Mac). The reason we added this certificate is that Apple are about to release a new version of Mac OS X in which only signed applications can be installed. We’ve updated our service today with several new features. Most notably, you can now select which groups of users will be able to enter your worlds even if you didn’t use Facebook or Twitter to sign up to Kitely. 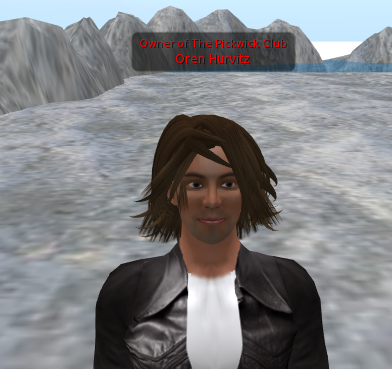 We now support OpenSim groups. Groups enable you to allow only selected users to build in your worlds. Groups are also useful for sending instant messages to multiple people at the same time. These options are available inside your virtual world viewer; see this page for more information. You can also use these Avatar Groups to control who can access your worlds. Previously it was only possible to specify access options using Facebook Groups and Twitter Lists, which means that if you did not sign up for Kitely using Facebook or Twitter then you had only two options for access control: “Only Me” and “Everyone”. Now you have the option of creating or joining a group in a virtual world, and then allowing free access to your world only to members of that group. Here’s how to add an avatar group to a world’s access permissions: open the world’s Edit World dialog; press the Add Visitors button; and select the group you want from the Avatar Groups section. It lists all the OpenSim groups that you are a member of. You can now share details about yourself with other users and view the information that other people have chosen to share about themselves. If you send an instant message to a user that is currently not logged-in then your message will be saved, and delivered the next time that user logs-in. We’ve changed the default world settings in order to prevent unscrupulous users from destroying peoples’ hard work, or annoying other users. All new worlds are now configured to allow only the world manager to build in them. “Pushing” is also disabled by default. In order to protect our existing users, we’ve also applied these settings to all of the worlds currently in Kitely. If you do want to allow others to build in your world then simply enable that option for that world using your virtual world viewer. However, for your protection we recommend that you don’t allow just anyone to build in your world. Instead, use Groups to give build permissions only to users that you trust. We’ve updated the OAR format in order to save your region’s Telehub, if you have one. A Telehub is a way to control where users appear when they enter your world. There is one caveat, however: telehubs only work if you disable Allow Direct Teleport in the Estate tab, but that option is not saved in the OAR because technically it isn’t part of the region (it belongs to the Estate). Therefore, if you load an OAR with a Telehub, and the telehub doesn’t work, you may need to disable Allow Direct Teleport. We’ve updated Kitely Plugin on Windows to version 2.0.1. The only difference from version 2.0.0 is that we use a new digital certificate, because the previous one has expired. The Mac OS X plugin hasn’t changed, so its latest version is still 2.0.0.